She knew that I was my father’s daughter when I wouldn’t stop eating multiple pieces of fish. I think she was happy to see me devouring my dinner and methodically removing all the bones at a young age. Even to this day, I find the more bones there are, the tastier the fish. Whether that’s due to having to work for your food (and therefore, we really savor it) or it really is true, who knows. But, for me, there’s an unquestionable bias for ocean fish. A big YES to ocean fish! 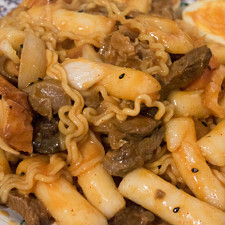 It was really satisfying to learn how to make one of my favorite dishes. I’m so glad that my mom reassured me how easy this dish is, and how it makes dinnertime a breeze. Dispatch your mackerel by removing scales, fins, gills, and guts. If this has already been done for you, rinse and cut the fish into large chunks about 1½-2½ inches in length. Wash and peel the radish. Roughly cut them into 1-inch cubes. Remove the stem and root of the onion, discard the first layer, and slice into crescents. Rinse and remove the roots and wilted portions from the scallions, then slice into 2-inch lengths. Separate the whites from the greens. Mince the garlic and ginger. 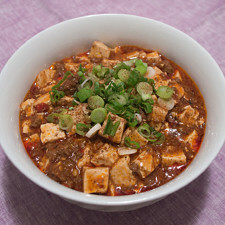 In a small bowl, bring together the soy sauce, water, sugar, perilla seed, sesame oil, and desired amount of pepper flakes. Add the ginger, garlic, and the white parts of the scallions. Mix well. 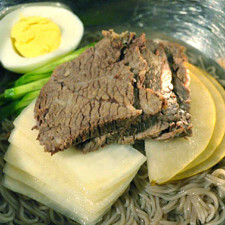 In a large pot, place a layer of radish and sliced onions on the bottom. Take half of the mackerel and lay them on top. Season the fish and vegetables with part of the soy sauce mixture. Repeat the layering with more vegetables, then the other half of the mackerel. Season again, and add any remaining vegetables and sauce into the pot. Bring the flame to medium-high and cook, uncovered, for 5-8 minutes. Decrease the flame to low-medium and gently flip the contents. Cover and simmer for 30-40 min flipping the fish and vegetables once or twice, carefully. 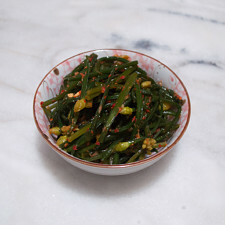 Once the mackerel and radishes are sufficiently seasoned and cooked through, throw in the green parts of the scallions. Turn off the flame and let the pot sit for a few minutes before serving in a communal bowl with rice and side dishes. We have Atlantic mackerel here in New York, and I've been finding somewhat small ones during the winter. They average about 25-30cm in length, and about 100-150g per fish. If your fish are heavier or larger, I suggest adding another tablespoon of soy sauce into the pot. Pacific mackerel are a bit larger, and what I grew up eating. The radish doesn't have to be perfectly cubed. 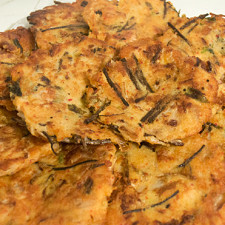 They just need to be large enough to withstand the long cooking time without turning too soft. Likewise, the onions will shrink considerably, so bear in mind that they should be sliced thickly. 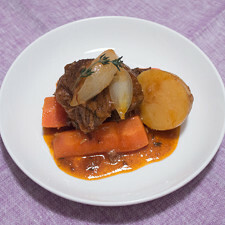 I try not to add too much water to this recipe, as the radish and onions expel a lot of liquid into the pot, and we want to keep this more like a braise instead of a soup. The onion, garlic, ginger, and perilla seeds all help to keep the fishy smell down. You can also add a few stems of shungiku/kikuna, also known as garland chrysanthemum, into the pot, right before the flame is turned off. This will help with some of the smell. I put in about a tablespoon of red pepper flakes for this recipe, but more can be added to make the fish a little spicier. When the fish is done, it will be firm, and the radish will be translucent and browned from the soy sauce. 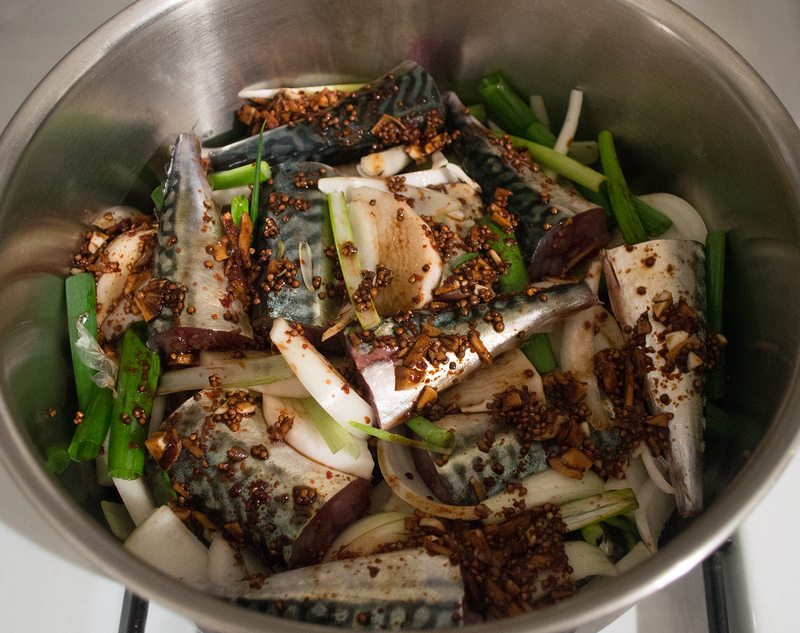 Made our Recipe for Godeungeo Jorim (고등어 조림) - Spicy Soy-Sauce-Braised Mackerel? Here’s how the mackerel looks right before turning on the heat. I’ve added some of the green scallions into the pot, but left most of it out to add some color back into the dish after cooking. 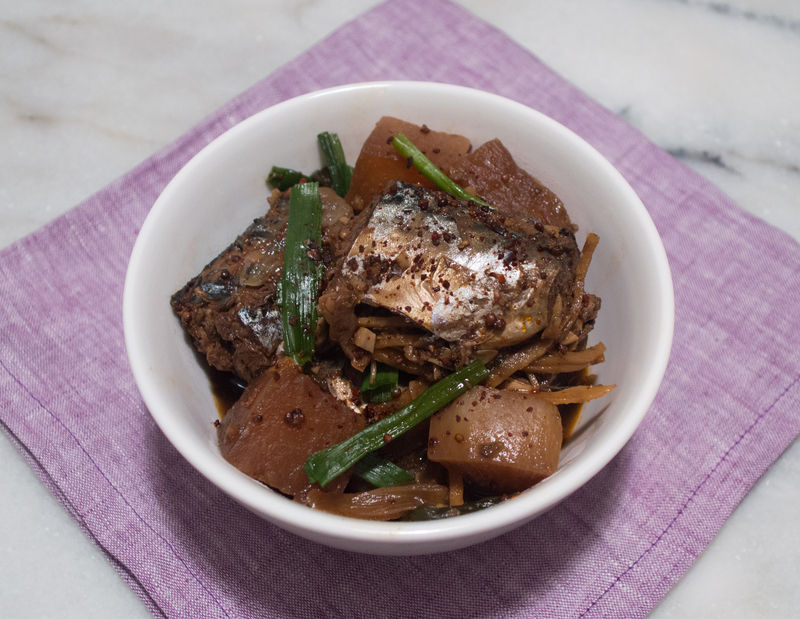 No thoughts on "Godeungeo Jorim (고등어 조림) – Spicy Soy–Sauce–Braised Mackerel Recipe."